Do you have a large group coming for a meal? Or a birthday party that you’d like to reserve an area of the bar for? We can help! For dinner reservations or VIP service during nightlife hours contact us to reserve a table. We’ll be more than happy to accomodate you and your group on any night we are open. Big Private Party and not sure where to go? Come reserve a spot with us! Our Private Party section can hold about 30 people in this area offering privacy, but keeping you close to all the action! 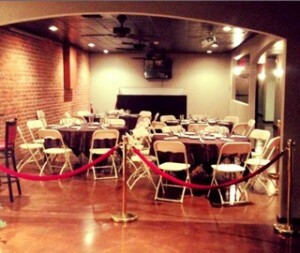 Call us at 209-667-1561 and reserve the private party section today! Contact us at 667-1561 for more information or to schedule a reservation. You are only allowed to be 15 minutes late to your reservation without penalties. We will give the reservation away after 15 minutes to our discretion and charge the card on file. Red Brick Bar and Grill has the right to charge HALF the price of what your bill would have been along with 18% Gratuity from the original price if you are a no call no show. We need the person paying to be first to the reservation. We do not answer the phone after 9 pm.